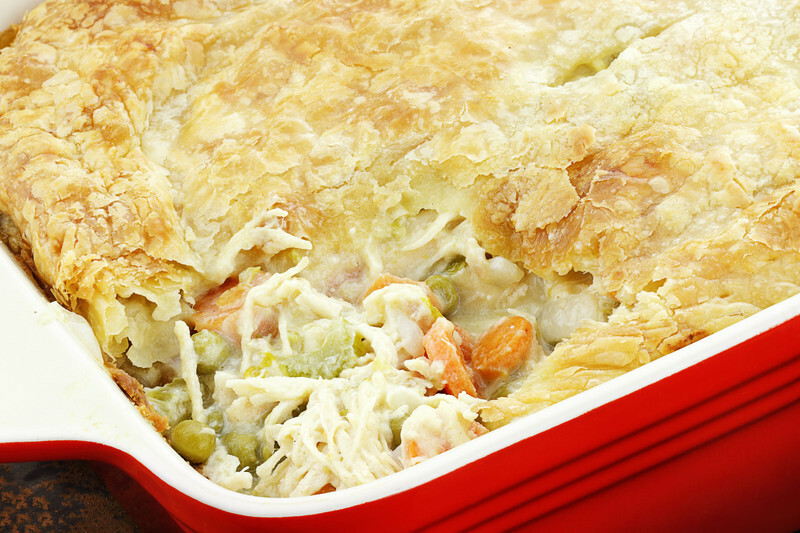 This homemade chicken pot pie recipe produces a creamy and savory filling with a flaky melt-in-your-mouth crust; comfort food at it's best. Serve with warm homemade bread and a fresh salad with homemade salad dressing. More chicken recipes at the end of the page. If you have a deep dish pie plate, use that for the crust. Brush the bottom crust with egg white and bake for 5 minutes; poking holes all over the crust so it doesn't bubble up. Set aside. In a saucepan over medium-high, add the butter and canola oil and heat. Then combine chicken, potatoes, carrots, peas, celery and onion. Saute until chicken is done and vegetables are tender. Remove from heat, drain and set aside. Stir in flour, salt, garlic powder, onion powder, and black pepper. Slowly add the chicken broth and evaporated milk; whisking continuously over medium heat until thick. Remove from heat and set aside. Mix the sauce and chicken mixture together and pour mixture into the bottom pie crust. Cover with top crust, seal edges, and cut away excess dough. Make several small slits in the top to allow steam to escape. Bake for 45 minutes, or until pastry is golden brown and filling is bubbly. Cool for 10 minutes before serving. NOTE: You may also use phyllo puff pastry dough and bake in ramekins...works out perfectly for individual servings. For the chicken broth, I use "Better Than Bouillon Chicken Base mixed with water - a beautiful chicken flavor that is better than canned chicken broth.